Die Laughing Productions is the world’s greatest Murder Mystery Company. All shows are created by and performed by professional stand up comedians. Each show is a third scripted, a third improv, a third audience participation and 100% funny. 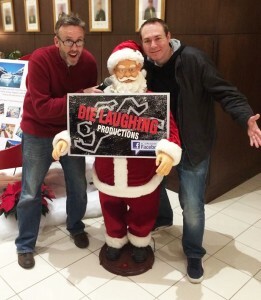 The brains behind Die Laughing Productions are stand up comedians and radio personalities Rob Maher and Joe Robinson. Rob and Joe are veterans of the comedy industry having each performed professionally for over 15 years. Rob was a finalist in Comedy Central’s Up Next competition and has performed for our troops in 14 countries. Joe is the former host of 98 Rock’s Irresponsible Radio and is an Arlington Drafthouse Comedian of the year winner. Both comedians are regular contributors to the 98 Rock morning show and are featured performers at Improv and Funny Bone comedy clubs nationwide. You can hear Rob and Joe every Sunday this football season co hosting the Baltimore Ravens postgame show and hear them every week on their top rated comedy podcast, the Rob and Joe Show.